Дополнение: Запас хода до 48 часов. Задняя крышка прозрачная. Case Shape: Round Material: Stainless steel Glass: Scratch-resistant sapphire crystal, with several layers of anti-reflective coating on the underside Case back: Transparent case back with sapphire crystal Dimension: ? 44.00 mm Water resistance: Water-resistant to 3 bar Movement and Functions Caliber: L707, Self winding mechanical movement with 4 retrograde functions and moon phase beating at 28'800 vibrations per hours and providing 48 hours of power reserve Function: Hours, minutes. Retrograde hand displays: day at 12 o'clock, date on the right hand side of the dial, small second at 6 o'clock, and 24 hours second time zone on the left hand side of the dial. 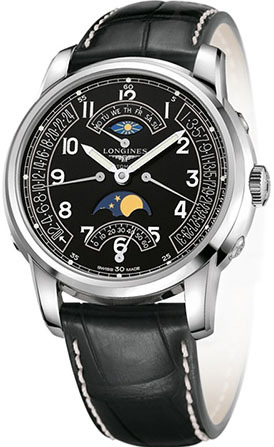 Moonphase display at 6 o’clock and day/night indicator at 12 o’clock. Dial and Hands Color: Black Hours markers: Painted Arabic numerals, with Super-LumiNova ® Hands: Silvered polished hands, with Super-LumiNova ® Bracelet Material: Alligator strap Color: Black Buckle: With triple safety folding clasp and push-piece opening mechanism. Есть вопросы по Longines Watchmaking Tradition Saint-Imier Collection L2.764.4.53.3?